Underground lawn and landscape irrigation systems may seem complex, but the principles by which they operate are fairly simple, and understanding a little about the system will help you understand the problems that can occur. With rare exception, most homeowners find it possible to repair these problems themselves. An in-ground lawn sprinkler system consists of several key components. In the typical system, a water supply pipe from the main water source first passes into a valve box set at ground level, where it is divided into individual underground irrigation zones, each controlled by its own zone valve. The zone valves are governed by an electronic controller, which sets the time and duration of each watering session via low-voltage wires. Smaller homes may have just one irrigation zone, but most have two, three, or more. The zone valves themselves consist of a diaphragm that controls the flow of water, and the diaphragm is open and closed based on signals received by a solenoid mounted on the zone valve. The selenoid controls a spring-loaded metal piston that opens or closes the water port passing through the valve. Irrigation zone valves come in many shapes and configurations, including models that integrate an anti-siphon device. In other systems, the anti-siphon valve is a separate device that is installed on the water pipe before it reaches the valve box. When a zone valve opens, water flows through underground plastic tubing to feed sprinkler heads that pop up and distribute water to the lawn and landscape for however lawn the controller allows the zone valve to remain open. 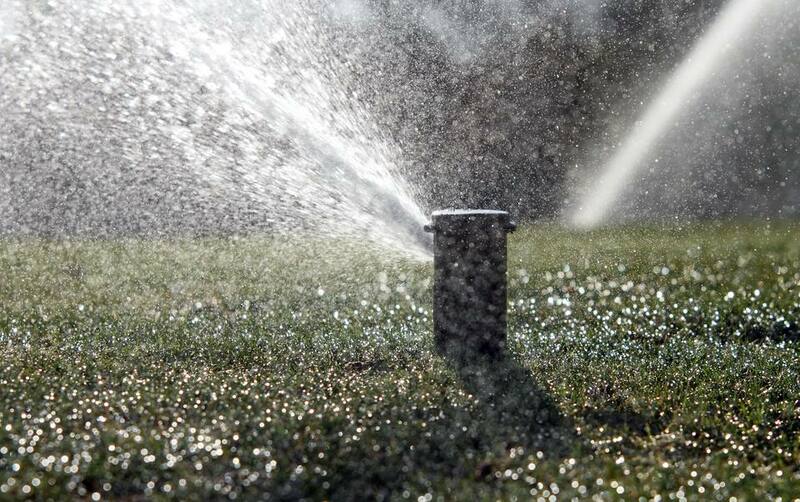 Troubleshooting a lawn sprinkler system involves carefully observing the symptoms. This will usually steer you to the nature of the problem and the solutions to it. Damage to sprinkler heads are very common if the heads are set too high and are run over by lawn mowers or cars. To determine if the backflow device is malfunctioning, first, make sure the water valves at the backflow device are turned fully on. The backflow device is normally located above ground, just above where the water pipe descends down to the valves that split the water into separate sources. A more serious cause is when there is a water pipe leak somewhere along one of the underground irrigation lines. Such water line problems are usually located somewhere between the valves and the first sprinkler head. You may find areas of soggy lawn where water is pooling or even gurgling up. This is the point where you will need to dig down and repair the water line. If no obvious leak is apparent, the irrigation line may be crushed or compressed so that water is restricted. This can be caused by tree roots or because a vehicle has compressed the soil and compressed the pipe. The only option here is to systematically dig up the lawn until you find the bad pipe. When the sprinkler zones do not turn on at all, it is generally a problem with the electrical signals running from the controller to the valve solenoids. More rarely, it is caused by a faulty valve that needs to be rebuilt or replaced. The problem may be with insufficient voltage to the terminals that feed the wires leading the problem zone. You can use a multimeter to test between the common terminal and zone terminal—if the voltage is too low (they should be between 24 to 28 volts) you will need to replace the entire controller. The solenoid on the valve may be faulty. In this case, you will need to replace the solenoid. With the controller in the OFF position, simply remove the wires on the solenoid and unscrew it from the valve. Screw on a new solenoid and reconnect the wires. The valve itself may need to be rebuilt or replaced. In some cases, simply disassembling and cleaning the diaphragm will solve the problem. In other cases, replacing the diaphragm and spring will be the fix. In severe cases, replacing the entire valve will be the solution. The problem may be with the transformer that supplies low-voltage power to the controller. Use a multitester to test the wire terminals marked "24-vac." If the reading is below about 22 volts, you will need to replace the transformer. On valves where the anti-siphon device is built into the valve, the problem may my resolved simply by tightening the screws holding the cover to the body of the valve. Leaking can be caused by a torn or damaged diaphragm inside the valve. In this case, disassemble and rebuild the valve with a new diaphragm. A cracked valve body can cause leaking. In this circumstance, replace the zone valve. A dirty or damaged sprinkler head that needs to be cleaned or replaced. Inspect the head and correct any problems you find. A worn-out or damaged zone valve can also cause this symptom. It may be a sign that the valve is failing to close completely. Dissemble, clean, and rebuilt the valve. If this does not solve the problem, the valve may need to be replaced. A valve that is installed backward may also cause this problem. Check the valve to make sure the flow direction is correct.